One of my favorite quotes about distance is “ Absence is to love as wind is to fire; it extinguishes the small and kindles the great” by Roger de Bussy-Rabutin; this is very fitting for Shannon and Connor. The couple met in high school but after experiencing long distance during college; and even longer distance when Shannon studied abroad her sophomore year of college, they both say the moment they knew it was meant to be is when they knew they never wanted to be apart ever again. It’s beautiful that through it all Connor and Shannon chose to keep choosing each other and now want to make that commitment to each other for the rest of their lives. Connor’s first impression of Shannon was that he loved how light hearted she is and Shannon couldn’t get over Connor’s bright blue eyes. With both of them being from the suburbs of the Windy City has played a big part in their relationship. For their engagement session Shannon and Connor wanted to take it to the streets of Chicago to showcase some their favorite spots that they enjoy visiting together. From the Riverwalk to the Lakefront their chemistry together is undeniable. They also plan on having their wedding in the Windy City and they can’t wait to share their special day with all their family and friends in the city they love. Together they love to watch movies, go out to eat and take walks. Along with sit on their deck and eat ice cream. Connor’s favorite is cookie dough and Shannon’s is banana…but unfortunately she can never find it! They admit that they are kind of opposites with Connor being more laid back and quiet while Shannon is the talkative and high strung; but that’s what makes them so good together. They balance each other out and make one half of a whole. 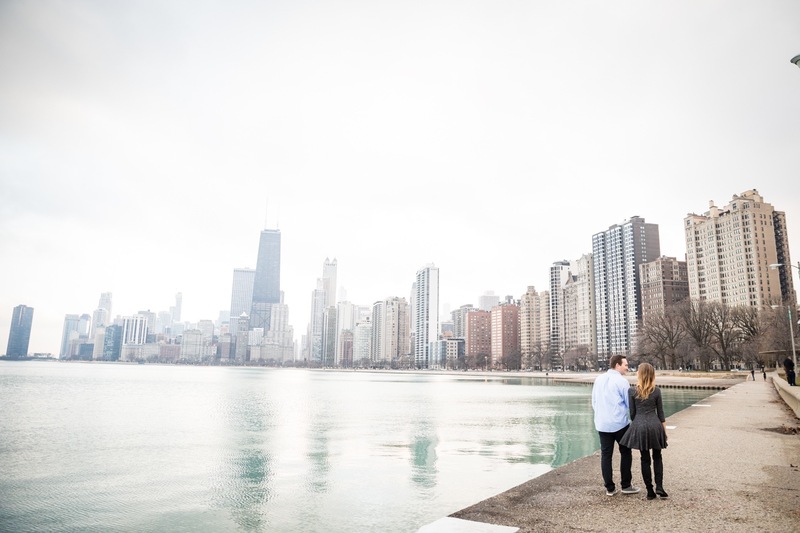 If you loved this post you’ll also want to check out Lauren and Trevor’s Chicago Engagement session! « Should You Have Your Wedding on a Holiday?